AdvantaClear Surface Disinfectant is the newest product from Hu-Friedy, a trusted leader in infection prevention. AdvantaClear Surface Disinfectant is designed to clean and disinfect dental surfaces while working extremely fast and effectively killing a broad spectrum of disease-causing microorganisms in one minute*. 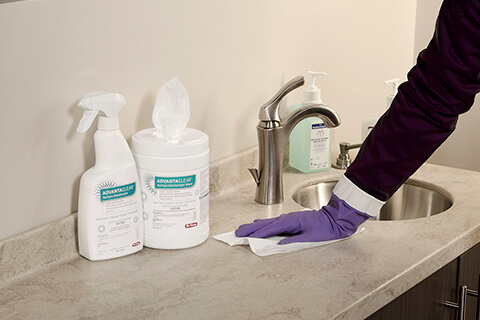 In a product evaluation with Dental Advisor, AdvantaClear Surface Disinfectant wipes scored a 4.5+ and 93% clinical performance rating. Click here to read the full evaluation. Fast-Acting One Minute Contact Time: A broad-spectrum disinfectant with one minute kill time* — faster kill times mean faster turnover. Safe on Surfaces: Designed to be compatible with a wide range of surfaces including acrylic, aluminum, brass, copper, stainless steel, chrome, plastics and more. Cleans and Disinfects: Quick and easy way to effectively clean and disinfect surfaces. Fragrance Free: Helps eliminate odor-causing bacteria with no harsh fragrance. Low Alcohol Formula: Will not affix blood and soil to surfaces. Fill out the form to request your free sample of AdvantaClear Surface Disinfectant to see firsthand how it helps dental practices just like yours get clear. Sample offer valid in the U.S. only, while supplies last. One sample per customer. ©2019 Hu-Friedy Mfg. Co. LLC. All rights reserved. Samples are subject to Sunshine Act disclosure requirements. Sign Me Up For Email From Hu-Friedy! Enter your email address to receive exclusive news, updates and offers from Hu-Friedy.